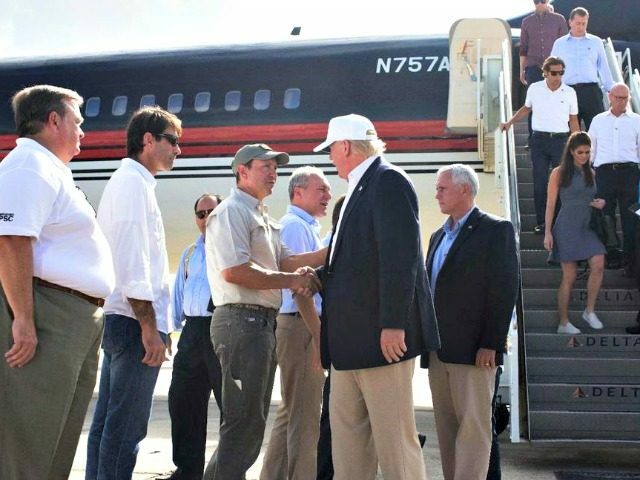 Republican presidential candidate Donald Trump arrived in Baton Rouge, Louisiana Friday morning to tour the flood damaged state where at least 13 have been killed and 30,000 have been forced to leave their homes. “Pence, along with his wife Karen and daughter Charlotte, received a briefing on the damage from Louisiana Attorney General Jeff Landry, Lieutenant Gov. Billy Nungesser and Commissioner Eric Skrmetta,” ABC News reported. Notably, Gov. John Bel Edwards, a Democrat, did not brief Pence. And, as has been documented ad nauseam, there’s really no such thing as a vacation for a president of the United States.“Presidents don’t get vacations — they just get a change of scenery,” Nancy Reagan famously told critics of her husband’s regular trips to the family’s ranch. Work, especially in this digital age, follows you around. Obama has long been a rejectionist on this front. His stubborn refusal to rebut claims regarding what was in the Affordable Care Act badly hamstrung his party’s attempt to win the fight for public perception on the law. His unwillingness to say the words “radical Islamic terror” have become a hobbyhorse for conservatives and Republican presidential nominee Donald Trump. And so on and so forth. Obama just doesn’t like to fake it. If he doesn’t want to do something or thinks it’s stupid to do it — regardless of whether it actually is stupid — he won’t do it. Donald Trump is receiving a warm reception as he tours a heavily-damaged portion of East Baton Rouge Parish in Louisiana. The GOP nominee and his running mate Mike Pence were greeted by a crowd of supporters after visiting a local Baptist church where volunteers have gathered. Trump greeted the crowd, shaking hands and signing hats. But he turned down a plate of the south Louisiana specialty, jambalaya, offered to him. Donald Trump and Mike Pence have stopped at a Baptist church in a heavily damaged portion of East Baton Rouge Parish. The Republican candidates met a group of volunteers who have been cooking meals for flood victims and helping the elderly gut their homes. Trump asked questions about the extent of the damage and thanked volunteers for their efforts. The candidate also met with Tony Perkins, president of the Family Research Council. Perkins own home was flooded. The prominent Christian conservative says he wants Trump to “let the country know” about the extent of the damage.